Welcome to Parascak Family Chiropractic! When you visit our practice, you’ll be treated as part of our family. We want to ensure you are comfortable throughout all stages of your care. When you first arrive at Parascak Family Chiropractic, our friendly team will greet you and prepare you for your consultation. Dr. Brad will take the time to get to know you and to discuss with you your health concerns. During your consultation, our team will take a detailed health history. 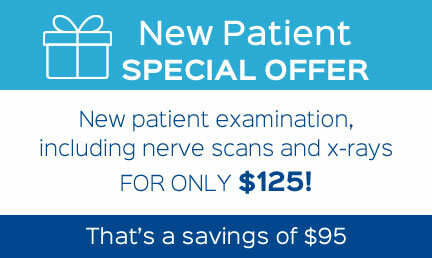 If necessary, you may have a computerized nerve scan or digital X-rays. Dr. Brad will also conduct a thorough, hands-on examination of your spine. You should expect this first visit to last approximately 45 to 60 minutes. If you are a good candidate for chiropractic care, you’ll be scheduled to return to our office for a follow-up visit. During this visit, Dr. Brad will provide you with a detailed overview of chiropractic and with specific recommendations for your treatment. If you and Dr. Brad agree that you are ready to move forward, you’ll receive your first adjustment. Future visits will take just a few minutes each. When you arrive for your appointments, you’ll sign in, and a member of our team will show you to the treatment area where you can lie down and prepare for your adjustment. Dr. Brad will discuss with you any concerns you might have, and you’ll receive your adjustment. Some patients initially express concern about having to receive chiropractic care for the rest of their lives. Once you experience the relief that chiropractic care can bring, you might ask why you wouldn’t want to maintain your great results for a lifetime. Chiropractic is a lifestyle. Everyday life puts a lot of stress on our bodies, and chiropractic helps remove the stress that takes us away from good health. How long you undergo chiropractic care is entirely up to you. We’ll first focus on getting you well; then we’ll talk about wellness. You can decide what you’re comfortable with, and we’ll take it from there. Why wait to get started? Call our office now!